Many states allow students to earn credits in high school that can be applied towards a postsecondary degree or credential â€” a strategy known as dual, or concurrent, enrollment. While dual enrollment makes it easier and more affordable to obtain a postsecondary credential, states must pass policies to ensure students are receiving this advanced instruction from qualified teachers. To further explore this challenge, the Education Commission of the States last month released a 50-state report exploring the requirements that states are using to approve dual enrollment faculty. 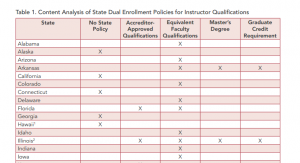 The report finds that most states (35 in total) require dual enrollment instructors to meet the same qualifications as faculty at postsecondary institutions. Other states only require a combination of graduate credits or work experience related to their subject of instruction. 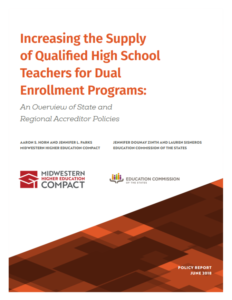 Interestingly, some states, such as Missouri, permit Career Technical Education (CTE) instructors to teach dual credit courses without meeting postsecondary faculty qualifications as long as they demonstrate experience through â€œworking in the field, industry certification and years of experience.â€ In addition to detailing faculty qualification policies, the report highlights strategies that states are using to train their existing teacher workforce to teach dual enrollment courses. Such strategies are critical for providing students with seamless pathways to postsecondary credentials and future jobs. 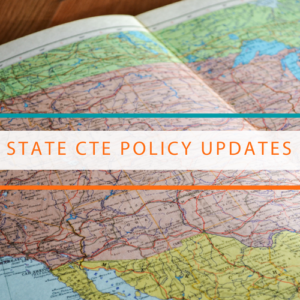 In other policy news, three states are taking steps to invest in CTE and workforce training programs. In Massachusetts the legislature passed a comprehensive economic development bill that includes $45.9 million to establish, upgrade and expand CTE and training programs that are aligned to workforce development priorities. Meanwhile, Kentucky is now accepting applications for the $100 million Work Ready Skills Initiative, a bond-funded grant program to galvanize regional cross-sector partnerships and bring CTE facilities up to industry standards. The initiative was authorized in a recent budget bill and requires a 10 percent match from local partners. Virginia residents can now earn a high-demand credential at a third of the cost under the New Economy Workforce Credential Grant program. The grant, which was passed in March, is designed to increase access to noncredit workforce training programs in high-demand fields. Under the program, the state Board of Workforce Development is required to publish a list of noncredit workforce training programs related to high-demand fields each year, which it has already done here for 2016. As the new school year approaches, so do new opportunities to expand high-quality CTE across the states. Keep an eye on this feed for more updates.